Hello there, my Nerdy but Flirty friends! New York Comic Con is upon us. I’m sadly missing out this year, but wanted to bestow some advice on you, especially for any newbies. NYCC is a blast, but it can be overwhelming. Check out my list, arrive prepared, and have a blast! Bring food! I always pack lunch and snacks, as well as a water bottle. You save money and time by not having to get food from the Javits Center. Wear layers, if possible! Some years, it;s super cold on your way to Con, but by the time you’re inside, and especially mingling with the massive crowds, you’ll be sweating. The temperature between outside and inside can vary 30 degrees. Be prepared. Your backpack is your friend! Use it or a good-sized bag for all the free swag you pick up and goodies you buy. The temptation is immense, and it’s always better to be able to put your purchases safely away in a secure bag than have to hold them in your hands. Also, keep tabs on your bags at all times, from transit to the streets to the Con. There are so many people and so much to see, you can easily get excited and put your bag down, only to have it go missing. Also: BRING CASH! Take photos! There’s a photo-op around every corner. Two of my favorite pictures I’ve taken at NYCC: one of Daredevil and Scorpion “sparring,” and another of Jack Skellington and Jesus hanging out. Anything can happen at Comic Con! Please take a ton and share them on social media so I can pretend I’m there with you all! Make sure to ask permission before you take a picture of someone’s cosplay. Say “cheese!” Get ready to have your photo taken! If you’re dressed as Wonder Woman, Batman, or any other character kids like, be prepared to have little ones asking for a picture with you, a hug, or even an autograph! Just have fun and go with it! Don’t kill your feet, and your vibe! I know that some cosplay choices mean funky shoes. I get it. Be true to your cosplay! But also, think of your feet. If wearing comfy shoes isn’t an option, at least bring a change of shoes. Nothing will ruin your Con experience more than aching feet. Don’t leave home without ‘em! My list for what every nerdy girl should bring to NYCC: waterproof makeup, elastics for your hair, deodorant, hand sanitizer, baby wipes, tissues, band-aids, Tylenol/Advil, Benadryl/Sudafed, gum/mints, and your phone charger. If you’re cosplaying, bring a small sewing kit, glue, and any other supplies you may need to repair your outfit or accessories. With so many people, stairs, escalators, traveling on transit, and so forth, it’s highly likely something might tear or rip and need fixing! If you’re attending more than one day, pace yourself. It’s overwhelming when you first enter NYCC, but if you have more than one day, you’ve got plenty of time to see it all. Review what panels and special events you’re attending, always cushion in more time for those lines, and then map out the rest of the space. Or, totally wing it and be happy no matter what you get to do, because OMG YOU ARE AT NEW YORK COMIC CON! I attended my first Con with that attitude. I went with no plan and no map; we just wandered around and took it all in. Use mass transit! If you don’t live in NYC, I highly recommend coming into the city by bus or train. I’ve always used the train. It’s a lot of fun picking out fellow Con goers at each stop. There’s something about being on a train with Captain America, Princess Peach, and Gandalf that just really makes you feel like a kid again. If you don’t have to get to the Con ridiculously early to make a panel, arrive an hour after opening. I’ve walked right in, no line, each time by doing this. Check the weather forecast! If it’s going to rain, you must have an umbrella or other rain gear. Unless someone is driving and dropping you off right in front of the Javits Center, you’ll have at least a few blocks to walk. Your gorgeous cosplay clothes and makeup will be destroyed before you even enter the building. Be prepared for wind too. The Convention Center is right on the water, so it’s usually windy, which can be an issue for hair and other cosplay efforts. There are shuttles being offered this year, but based on the crowds I’ve walked with to and from NYCC, I imagine there will be quite a wait for these, and you never know if an issue arises and they can’t offer them when you need one. 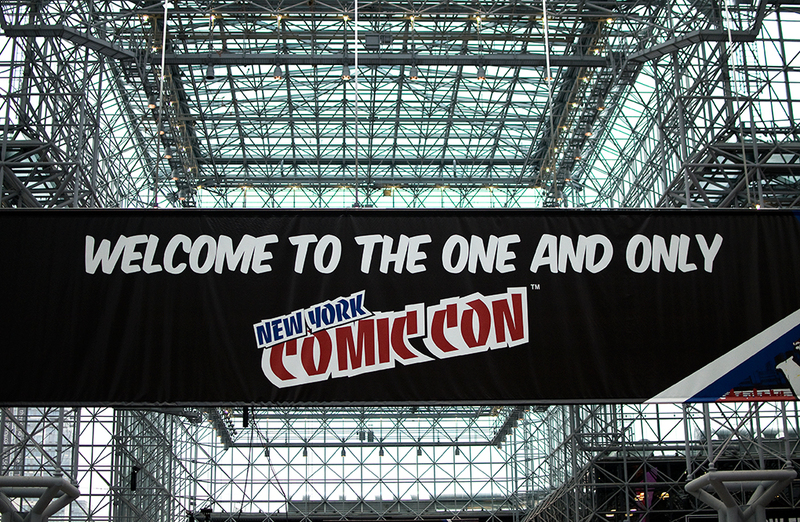 Info on the shuttles, plus other NYCC advice, is available here. One more thing to address, and one I wish I didn’t need to bring it up, but please have a look at the NYCC Harassment Policy. Remember everyone, cosplay is not consent. Let 2015 be an incident-free and fun year for all!